HowToRepairGuide.com: How to replace starter on 1996 saab 900? The starter is located on the rear of the block on the LHD drivers side, parallel to the alternator. To change it, you either need to drive the car up ramps, or jack and support the front end. Whatever you do, disconnect the battery before disconnecting the starter because the positive battey cable goes directly to the starter and then to the alternator and it is very easy to short if not disconnected at the battery terminals. replace the starter motor and check the flywheel teeth when starter is removed from vehicle ! So you need to remove the starter assembly from your car. If you narrowed your problem down to the solenoid, you could try and just remove the solenoid by itself - there are 3 philips flathead screws holding it to the starter motor housing, but I did not see that possible. The access is difficult, the screws will be on very tight, and it is really easy to shear off the philips head pattern. In fact, even when I removed the starter from my car, I had trouble removing the solenoid screws. If you still want to try removing just the solenoid, follow the steps below as far as needed to get enough access to the philips screws and then use a rachet with an appropriate philips driver. Press hard and at the right angle, or you will shear off the bolt pattern. (Regular screwdriver did not work for me). Remove air filter and AMM (air mass meter) in one piece. Disconnect TPS (throttle position sensor) from its wiring to avoid damaging it. Disconnect some air ducts from the throttle body as needed to be able to move the wiring around enough to get good access to the black plastic cover sitting over your clutch and flywheel. I ended up disconnecting hoses from the dump valve (turbo), the AIC (automatic idle control) valve, and the crankcase breather pipe, if memory serves. Disconnect one grounding point on top of the cylinder head which has one black wire and one orange wire attached to it. This will help you move your wiring more freely to avoid inadvertantly damaging connections. Disconnect any cables/connections on the back of the starter. Those include battery and alternator cables at terminal 30 and the plastic spade connector at terminal 50. Also, disconnect similar spade connectors from throttle microswitch under the throttle valve pulley to get the wiring out of the way. Remove any bolts on the driver's side of the plastic clutch/flywheel cover . On cars with manual transmission, there are two bolts on the driver's side of the cover, the lower one, securing the cover to transmission housing, and the upper one, securing the cover and positive battery cable holder to engine backplate near the starter. Remove the starter mounting bracket on the back of the starter motor housing from the engine block. It is important that you unbolt this bracket from the engine block and not from the starter, else you will not be able to remove the starter. The picture shows where the mounting bracket bolts on to the engine block (empty bolt holes). The large coolant hose makes it a bit tough to access those 2 bolts. These bolts will need a lot of torque to undo. I first tried using a box end wrench, but it was useless: the bolts didn't even budge without enough leverage. Then I switched to rachet, which takes up more space but seemed to be the only way for me. You will need to pull and lift that coolant hose to give you enough clearance to get a rachet in there. It will take a little finesse, but there is enough room to pull and lift the hose without putting much stress on it. When I was doing this, some coolant spilled out of the crankcase breather pipe. I am not sure why. which is used to engage the starter motor gear into mesh with your flywheel. Often, just thoroughly cleaning the plunger and inside the solenoid will solve the problem of a sticking solenoid. and presses the gold-plated button inside the solenoid housing (see picture above), which creates a closed circuit across terminal 30 and "terminal 70" and makes the starter motor spin. After you clean the plunger, the insides of the solenoid housing, and its contacts, re-attach it to the starter motor housing with 3 bolts and re-install the wire strap that powers the starter motor from the solenoid. To test, use jumper cables to connect a positive battery terminal to terminal 30 on the solenoid and a negative battery terminal to the front of the starter motor housing. Now carefully and briefly power up terminal 50 by connecting a jumper between terminal 30 and terminal 50. Caution: if the starter motor will spin, it will generate large amounts of torque and will be difficult to hold in place, so before doing this test, lay it against the wheel of your car and step on it. Do not run this test for more than a couple seconds, or you will damage your starter motor! If this procedure does not fix the problem, solenoid windings may be damaged or its contacts could have eroded. Replace the solenoid. Since you removed the starter from your car, it might be a good idea now to take it apart and clean/lubricate the mechanism of your starter motor (but only if you found your starter motor to be healthy during the diagnostics!) It is an easy procedure, but prepare to get really dirty. That's 4 small magnets with the winding strap attached to them, sitting on the set of small brushes. At any circumstances, do NOT allow the ring that houses the 4 magnets to slide off the brushes. It is possible to re-install it if that happens, and I was successful at it, but it requires a lot of patience, strong fingers, and plenty of manual dexterity. It is easier to just not remove it. So now, you can connect all the dots of the inner workings of your starter motor. Play with the ring gear assembly to see how it works - it's fun! In the picture above, you can see that I took the motor out of its housing, but there is absolutely no need to do that. I did it out of curiousity and to clean things up a bit, but it is not worth the trouble really. At this point, inspect all the gearing and see if it is in good condition. I bought some nice, viscous Lithium grease and lubricated all the gearing to make it smooth and try to prolong its life. That includes motor pinion, ring gear, clutch, and front starter gear and shafts. Grease the gearing liberally and work the gears through the grease, but make sure you wipe away any excess grease. Make sure the clutch is well-lubricated, but that the excess grease does not make its extended and retracted positions stick! Same for the outermost gear that engages flywheel. Clean up whatever you can, but be especially careful with the coil windings of the motor because you do NOT want to scrape any insulation from those wires. Now, we can put everything back. I will assume you did not take out the motor from its housing. If you did, you know what the force of those magnets is, so when you put the motor back into its housing, hold in the ring assembly of those 4 magnets on the end so it does not slide out while you put the motor back in. Put the black plastic cap back on the ring gear and slide the ring gear assembly back onto the starter motor pinion, making sure that the divots in the housings align, as I pointed out before. Now, you can put the front part of the starter housing back on, taking care to align its bolt holes with the two threaded rods we took out earlier. Put the rubber piece in the housing and press the orange plastic pivot into it to secure the lever arm. Screw the rods in by hand and turn the motor to rest on the front of its housing and re-install the back plate, the washer, the ring clip, and the cap, securing it with two philips screws. Now tighten the rods with a 7-mm socket and a rachet. To reinstall the solenoid, hook its plunger into the lever arm and slide solenoid housing onto the plunger, remembering to put the spring under the plunger (or your starter motor may not disengage from the flywheel!). Re-install 3 bolts to secure solenoid housing to starter motor housing. 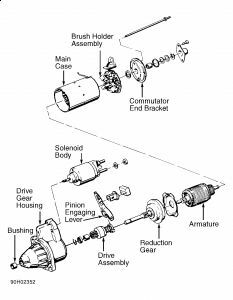 Installation of the starter back into your car is the reverse of the removal procedure outlined above. Labels: How to replace starter on 1996 saab 900. Oh wow... I just discovered my starter needs to be replaced and yours was the first hit on my search -- and you just posted this yesterday. What timing! One question, you mention I can just replace the solenoid if I have narrowed the problem down that far. What kind of diagnostics can I do to determine that, bearing in mind that I'm a software guy and lucky to figure out one end of a screwdriver from the other three times out of five? The only reason I know it's the starter is my wife told me that's what the clicking sound means when the battery is charged and I try to start it. I do have a voltmeter thingie, for what that's worth.